We’re super excited about a new Elizabeth Arden digital campaign we heard about from Swan Sit, vice president of digital at the iconic beauty brand and board member of the Women in Retail Leadership Circle. 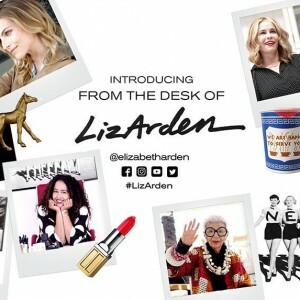 The multiplatform digital campaign, “From the Desk of Liz Arden,” was launched last month and pays homage to the entrepreneurial and inspirational voice of the brand’s eponymous founder. The campaign provides a fresh, personalized, behind-the-scenes consumer experience, while showcasing Elizabeth Arden’s rich and storied New York-centric heritage. Here’s the premise of the campaign: A fictional character, Liz Arden, is the brand’s new digital voice that personifies the company and brings the spirit of its founder to life in a modern, fashion-forward way. Liz offers an insider’s brand perspective as well as gives fans direct access to her inner circle and business-minded yet cheeky attitude, all set against the backdrop of New York City. Bringing the brand’s core values to life, Liz speaks in the first person, directly with consumers, to strongly resonate with them and their active lifestyles. The campaign makes use of a carefully curated influencer set to represent individuality and celebrate women who carve their own paths. For the launch, Elizabeth Arden partnered with comedian Chelsea Handler, fashion icon Iris Apfel, DJ Mia Moretti and style blogger Gabi Fresh. The campaign also features supermodel and Elizabeth Arden brand ambassador Karlina Caune, and fashion designer and Elizabeth Arden Style Director Shoshanna Gruss. To signal this digital makeover, the campaign opens with a <a href="https://www have a peek at this web-site.facebook.com/elizabethardenUS/videos/10153431131896637/”>video of Liz Arden moving into and decorating her new office. Liz taps a few of her like-minded friends to help reinvent the space with a blend of vintage items and new décor, with each leaving a small token for Liz to discover. Through social media, Liz Arden will become a relevant resource of aspiration and information for the brand’s core demographic — active, professional women. Taking inspiration from Ms. Arden’s famous quote, the content will encourage women to “go out and make their mark” as she did by pioneering the beauty industry over a hundred years ago. Liz will also be featured across the brand’s other digital touchpoints, including e-commerce and digital marketing programs. She will lend her voice to consumer emails and provide content and advice on the brand’s global websites, sharing not only her expertise but also that of her influential friends. The From the Desk of Liz Arden campaign will be completely rolled out by early June. It will be supported with extensive new content, paid media and ongoing influencer partnerships. Follow the campaign on Facebook, Instagram and Twitter using @ElizabethArden and #LizArden.